Tourists to the Old Town of Nice in Provence, France love to explore the narrow lanes where they find the best and most interesting places for shopping. 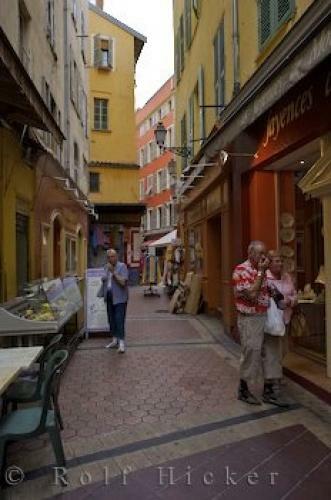 Some tourists who come to the Old Town of Nice in Provence, France never find a few of the stores located along the narrow lanes, it sometimes takes a return visit to explore all the shopping areas. The narrow lanes wind in and around the historic buildings which tourists find fascinating, with every building displaying an excellent variety of goods.The buildings are painted in an assortment of bright colors as the owners of the stores decorate the lanes with their items making it easier for tourists to browse while shopping. It is hard to walk away from this unique shopping area in the Old Town of Nice without buying at least one or two things.Shops along the narrow lanes of Old Town, Nice, Provence, Cote d'Azur, France, Europe. in the Old Town of Nice in Provence.